It’s one of the more proud-yet-nerve-wracking moments you will experience with your offspring. They have finally obtained that little slip of plastic that allows them to take a multi-ton vehicle and move it along the roads at fast-miles-per-hour, narrowly avoiding cars/guardrails/trees/other living things…oh, and have we talked about speed limits and how cops tend to really not like people disobeying them? We all remember a time where we were just getting the hang of this ‘driving’ thing, so we can also recall some of the more ‘duh’ moments we’ve had as young drivers. Those mistakes that we know we’re smarter than, yet still managed to make anyway. The experiences we had starting out can make for excellent tips for our newly-adventurous motorists, however. Here are some of the more common blunders new drivers make as they’re getting up to speed…as well as how to get them back on track so those mistakes don’t happen again. A quick glance around the interior of any vehicle just will not do it justice. Unfortunately, that’s about all the attention most new drivers give the area around their newfound Captain’s Chair. While it’s nowhere near as complicated as the cockpit of a plane, there are still several little things to understand and set up once you sit in the driver’s seat. Of course, adjusting the seat for comfort and the rear view mirror for visibility are important steps, but take a moment to understand the overall concept of blind spots so that the side mirrors can be taken care of. Overall visibility is key to any driver, but especially to people revving up their engines for the first time. Once the interior is set up comfortably, start thinking about the type of vehicle being driven. Younger drivers usually want a smaller car or larger, heavy duty trucks…both of which feature their own set of potential perils. Smaller vehicles – like most convertibles or two-door cars – are coveted because of their sense of speed (which can be a little untrue, thanks to technology). That fast feeling makes understanding ideas like proper stopping distances a high priority, as this will make their first trips on the freeways and interstates a little easier to handle. Along with the science of stopping, drivers in larger vehicles need to have better spatial awareness, partially so they aren’t being a rolling nuisance to other drivers and partially so they can develop good parking habits. Seriously…don’t let them be that person. 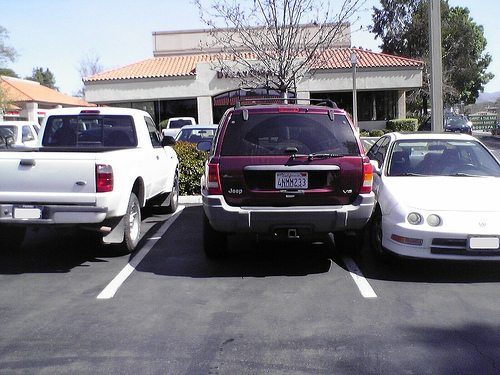 Spatial awareness is extremely important in regards to parking, so focus on it! So many bad driving habits can be formed thanks to watching other people get away with them or by reacting in the spur of the moment. Remember that common sense (buckling the seat belt, don’t use your bright lights if a car is approaching, etc.) can go a long way to making the driving experience smooth and easy. If they start asking you ‘why’ some of these tips are important, though, remember some quick facts: the National Sleep Foundation reports that driving while tired can be just as dangerous as drunk driving, and while forms of impaired driving have been on the decline according to National Highway & Transportation Administration, distracted driving has been on the rise recently. Of course, the most common form of distracted driving is a driver interacting with their phone; reading a text message, responding to e-mail, or even answering a call…all things we’re likely guilty of. The best advice is to simply find a nearby place to park before reading and responding, because no matter what anyone may tell you, multitasking isn’t one of our strong suits. You see and hear these tips constantly, but they warrant repeating because so many drivers – especially younger ones who may not have much experience – make these mistakes and fall into bad habits constantly. Keeping these and our other articles in mind will help you turn your new rookie pilot into a capable car commander in no time.